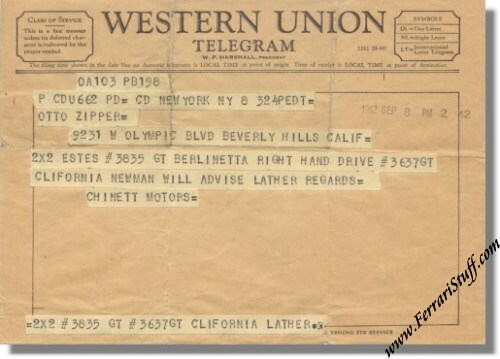 This is a vintage 1962 telegram from Luigi Chinetti Motors to Bob Estes of Otto Zipper Motor cars of Beverly Hills, CA regarding two Ferrari 250 GTE 2+2's. It concerns the cars with Serial Numbers 3835GT and 3637GT. "2x2 Estes # 3835 GT Berlinetta Right Hand Drive # 3637GT California Newman will advise lather regards= Chinetti Motors="
It is time / date stamped on September 8, 1962 2.42 PM.